A growing number of Americans are getting rides or booking short-term accommodations through online platforms such as Uber and Airbnb. This is nothing new in concept; brokers have operated for hundreds of years as go-betweens for producers and maconsumers. The ease with which this can be done through the Internet, however, has led to millions of people using these services, and to some of the nation’s fastest-growing, high-profile businesses. Uber Technologies Inc., for example, is the nation’s largest transportation network company (TNC). Uber operates an app that connects its drivers with individuals in need of a ride. The company is valued at $68 billion by private investors and is reported to have generated roughly $6 billion in revenue, after payouts to its drivers, in 2016. Along with its main competitor, Lyft, the company has wrested a significant share of the ride-hailing industry away from traditional taxis. Airbnb operates an online marketplace where property owners and tenants rent their residences to travelers. The company is worth $30 billion and its website includes listings for nearly 3 million short-term rentals in more than 34,000 cities around the world. Airbnb and similar companies such as VRBO and HomeAway are quickly encroaching on the business of traditional hotels and motels. This brief focuses largely on Uber and Airbnb because they are the largest and most prominent players in the gig economy. Many of the findings and conclusions contained in this brief, however, are applicable to other on-demand companies as well. From a tax perspective, the first question typically raised in the context of on-demand services provided by Uber, Airbnb, and other companies is whether the sales they are facilitating are subject to sales tax, lodging tax, gross receipts tax, or other taxes on consumption. When states and localities have already been taxing similar services provided by other companies (such as taxi rides or hotel rooms) there are compelling reasons to ensure that taxes are applied to these on-demand entities as well. It is a simple matter of equal treatment that on-demand companies pay the same taxes as more traditional companies they compete against. 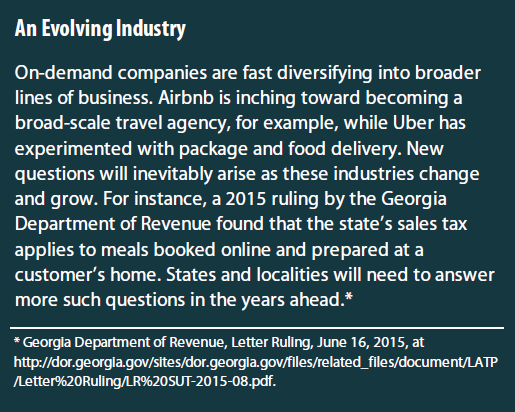 Moreover, doing so is important to ensuring that public revenues do not suffer because new types of companies have entered the ride-hailing or room rental market. As the economy changes, the tax system needs to keep pace. Bringing these companies within the scope of existing consumption taxes may involve updating definitions in laws that did not envision today’s on-demand services, or it may require regulations clarifying that existing laws do indeed apply to these new companies. In other instances, it may be necessary for officials to meet directly with the companies or in extreme cases, to pursue legal action when companies refuse to collect the taxes they owe. In most states, both taxi fares and rides with transportation network companies (TNCs) such as Uber are exempt from sales tax. This omission is largely a historical accident. When most sales taxes were enacted in the 1930s, tax administrators had fewer resources to identify and monitor sales of services, and services comprised a relatively small part of consumer spending. Thus, in the interest of expedience, sales taxes often were structured to apply only to sales of tangible personal property. As the service sector has grown and tax enforcement methods have improved, however, the costs of exempting services have come to outweigh the benefits. Only eight states currently apply sales or gross receipts taxes to taxi fares: Georgia, Hawaii, New Mexico, Ohio, Rhode Island, South Dakota, Washington, and Wyoming. Because TNCs provide a service very similar to taxi rides, an equitable application of the sales tax requires that these states tax TNC rides as well. The nation’s largest TNCs (Uber and Lyft) do not operate in South Dakota or Wyoming, meaning that there are only six states where TNCs may be subject to existing statewide sales or gross receipts tax laws. In Rhode Island, taxi fares were added to the state’s sales tax base in 2012 but Lyft claimed the law did not apply to TNCs and Uber said the law was ambiguous. The state’s Division of Taxation disputed these claims and lawmakers ultimately stepped in to settle the matter definitively with a 2016 law clarifying that “an entity … that uses a digital network to connect transportation network company riders to transportation network operators who provide prearranged rides” must collect sales tax. The issue appears to remain unresolved in other states, such as Georgia and Ohio. Officials in these states have indicated that rides booked through TNCs should be subject to sales tax but declined to comment on the tax collection practices of specific companies. Yet TNC riders in these states report that sales tax is not being displayed on their receipts, suggesting that the companies are not collecting tax and that new laws, regulations, or enforcement actions by these states may be needed to ensure that taxis and TNCs are treated equitably under the sales tax. Georgia legislators have recently begun to consider legislation, which Uber opposes, that would require TNCs to collect sales tax in the same manner as taxis and limousines. But statements by the bill’s sponsor that it is intended to resolve a “disagreement” and that “it makes it clear that ride-share networks are covered under our sales tax law” suggests that TNC services may already be subject to sales tax and that the state could attempt to require tax collection even if the legislation fails to gain enactment. New York represents a unique case. In New York State, taxis are not subject to state sales taxes and TNCs are not allowed to operate in most parts of the state. In New York City, however, TNCs can operate as a “black car service” that is subject to state and local sales taxes, but not the mass transit surcharge paid by taxis. Aside from broad-based sales and gross receipts taxes, some states are now levying taxes specifically tailored to the TNC industry. Nevada imposes a 3 percent excise tax on such rides while South Carolina imposes a 1 percent fee and Massachusetts levies a 20-cent fee on each ride. In Pennsylvania, a state law requires TNCs to pay a 1.4 percent gross receipts tax but only on rides originating in the city of Philadelphia. Some localities are also levying taxes on TNCs, though others have seen their efforts preempted by state-level lawmakers. Maryland, for example, authorized localities that regulate taxis to levy up to a 25-cent surcharge on each ride for local transportation projects and Montgomery County initiated such a charge to fund transportation for the disabled. Chicago, Seattle, and Washington D.C. also have local-level taxes on TNCs as does New York City, as mentioned above. In Ohio, by contrast, localities are prohibited from enacting ordinances taxing TNCs under legislation signed by Gov. John Kasich in December 2015. Taxes on short-term accommodations vary dramatically across the country as they include various mixes of state sales taxes, state lodging taxes, and additional local levies. The combined tax rate on these accommodations is often higher than the general sales tax rate, in part to ensure that non-resident visitors pay toward the upkeep of the infrastructure and other public services they use during their stay. States and localities often devote some portion of the revenue raised by these taxes to promote tourism or fund specific projects such as convention centers. In Chicago, Airbnb guests are subject to an additional 4 percent surtax above the ordinary lodging tax rates in order to raise revenue for services for the homeless. Taxing rooms rented through online platforms such as Airbnb is vital to avoiding losses of public lodging tax revenues as these new operators seize business from traditional hotels. A study of the impact of Airbnb on hotels in Texas estimated that in Austin, where its impact was greatest, it caused a reduction in hotel revenue of 8 to 10 percent. As sales and gross receipts taxes are applied, governments must ensure that the online intermediaries, and not the individual drivers or hosts, are responsible for calculating and remitting the taxes due. Tax collection should be an automatic feature of the app or website. That is not always the case, and when it isn’t, seeing to it that the taxes are actually paid is difficult. These taxes also should cover that portion of the ride or room cost that goes to Uber (typically between 20 and 25 percent, in addition to a booking fee) and Airbnb (up to 15 percent). While this part of the transaction may already be covered under existing state law, as it is for rental platforms in Utah, for example, this is not the case in every state. Because Uber drivers and Airbnb hosts are using these platforms to earn income, there are income tax implications to the on-demand economy. Income earned while driving for a TNC is generally taxable under federal, state, and local income tax laws. Under Uber’s business model, its drivers are classified as contractors rather than employees. This decision by Uber means that it is not responsible for paying a minimum wage, Social Security taxes, Medicare taxes, unemployment insurance taxes, worker’s compensation, or providing most other employee protections. This model has been challenged in lawsuits and administrative rulings across the country. If Uber’s drivers are deemed to be contractors, they are essentially small business owners for tax purposes. This arrangement means that Uber drivers must pay their own Social Security and Medicare taxes (via a 15.3 percent federal self-employment tax) and are responsible for ensuring that federal, state, and local income taxes are paid in a timely fashion through quarterly estimated tax payments. If drivers were classified as employees instead, states and the federal government could insist that the companies withhold income taxes on behalf of the drivers—a move likely to ease tax compliance. An additional complication arises in states such as Kansas, Ohio, and South Carolina that have recently adopted special tax breaks for certain types of business income. Uber’s decision to treat its drivers as contractors means that drivers in these states have the ability to avoid some or all state income tax liability in a way that most of these states’ wage-earning residents cannot. While these types of breaks are still relatively rare, lawmakers at the federal level and in some states are considering enacting similar laws, contrary to the advice of analysts across the political spectrum. Rental income earned by property owners is exempt from federal income tax if the property was rented for 14 days or less during the last year. In the past this break was somewhat obscure, but its popularity has grown significantly in recent years as Airbnb and similar platforms have made it much easier for owners to find individuals interested in renting their properties for short stays. Since states and localities typically use federal income tax law as the starting point for their own income tax laws, this exemption is generally available against state and local income taxes as well. Uber drivers and Airbnb hosts subject to income tax can deduct the myriad expenses associated with earning income via these on-demand platforms. Drivers can deduct expenses such as gasoline and the wear-and-tear on their vehicles through the IRS’s standard mileage deduction. Even car washes and giveaways to riders such as mints or bottled water may be deductible. Airbnb hosts can deduct a percentage of their housing costs and other expenses such as cleaning or furniture purchases based on the share the rented area represents of the total area. These deductions are appropriate to the extent that they reflect the costs of earning income through on-demand platforms. Property tax laws often treat different types of properties in different ways and localities should take steps to ensure that Airbnb hosts receive the appropriate treatment under the property tax. Specifically, many jurisdictions provide local property tax reductions for owner-occupied homes and apply higher tax rates to hotels and other commercial properties. The rapid growth of Airbnb and similar rental platforms has blurred the line between homes, rental properties, and hotels in a way that could threaten the fair administration of property tax laws—but that could also give tax administrators a helpful new informational tool in ensuring that homeowner tax breaks are not abused. An individual who lives in their home most of the year and only rents it occasionally through Airbnb would generally be treated under the tax rules applying to owner-occupied residential property. Oftentimes, this means that the owner would benefit from a homestead exemption that shelters a certain portion of their home’s value from tax, as well as lower tax rates or advantageous assessment rules that sometimes apply to residential property. Property owners who live in a home for some portion of the year but do not use it as their primary residence should generally be treated as possessing a non-owner-occupied residence. This would entitle them to be taxed as owning residential property in areas where such a classification exists, though it would mean they typically would not receive the benefits of a homestead exemption. In extreme cases, some property owners are using Airbnb to run what some have argued amount to illegal hotels. Affordable housing advocates in Washington, D.C., for example, recently raised questions about a three-story building with 21 units rented out via Airbnb. Aside from the potential regulatory violations of this arrangement, there are also property tax implications because hotels in D.C. are taxed at a commercial property tax rate of $1.65 per $100 of assessed value whereas the owners of this hotel-like building have likely been paying the residential rate of $0.85 per $100 of assessed value. To be clear, the property tax implications of Airbnb vary considerably by jurisdiction. In localities offering little or no homestead exemption, and taxing residential and commercial property at the same rates, there are unlikely to be significant property tax issues associated with Airbnb. In Washington, D.C. or Chicago, on the other hand, the distinction between owner-occupied homes, rental property, and commercial property potentially matters a great deal. It is often difficult for tax officials to determine which treatment a specific property should receive, especially when doing so requires discerning whether a homeowner is spending sufficient time in their home for it to qualify as an owner-occupied residence. One way of helping to fill this informational void would be for income tax administrators to provide local property tax authorities with information on the rental income reported by property owners. When a homeowner reports earning significant rental income from their home on their income tax returns, that may indicate that the property is not owner-occupied and therefore not deserving of a homestead exemption. Airbnb and similar platforms could also aid localities in enforcing their property tax laws if the platforms shared information with local tax authorities regarding properties that were rented for more than some threshold number of nights. Airbnb has typically resisted sharing information with local governments, though it has done so in some cases. In New Orleans, for example, the company agreed to begin sharing the names and addresses of hosts with the city, and to prevent hosts from renting homes through the platform for more than 90 days. Airbnb also recently began assisting the city of Chicago in building a registry of its hosts inside the city that includes their names, addresses, and whether the unit listed is the host’s primary residence. Adding a requirement that Airbnb annually report the number of nights the unit was rented would be helpful in guaranteeing that the property is treated correctly under the property tax. Such a requirement would not be fundamentally different from the type of reporting the companies already engage in when informing the Internal Revenue Service (IRS) of their hosts’ rental income. While the existence of Airbnb and similar companies has arguably increased the likelihood of property tax abuses such as fraudulent homestead exemption claims, these companies have the ability to curb those abuses by sharing essential information with local tax authorities. Although it is impossible to precisely estimate the revenue impact associated with taxing the on-demand economy, it is clear that the figure is significant and growing. The following discussion offers some general insights into the revenue implications of the on-demand economy. Based on figures from the U.S. Census Bureau, taxi and limousine companies and independent drivers providing such services, including TNCs, brought in an estimated $17.5 billion in revenue in 2014. Had these services been subject to sales tax, this suggests a potential state and local sales tax revenue yield of at least $1.2 billion (under the median sales combined state and local sales tax rate of 6.9 percent). In reality, the nationwide revenue impact is likely larger since the industry is growing and since most taxi and TNC rides take place in large cities that tend to have higher sales tax rates. Because taxi, limousine, and TNC rides are exempt from most sales taxes, however, only a fraction of this potential revenue is currently being collected. Most of that $1.2 billion in potential revenue would come from the taxi industry, which remains the dominant player in the ride-hailing market in most cities. But TNCs such as Uber and Lyft have already surpassed taxis in the competition for business travelers and TNCs appear to be quickly catching up in the overall US market as well. 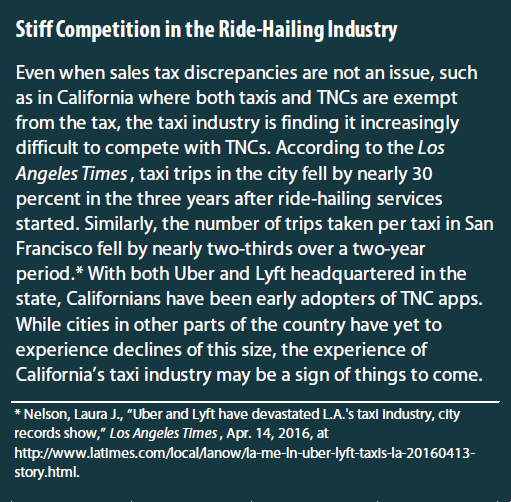 Based on media reports of Uber and Lyft’s US bookings, it appears that TNCs may enjoy as much as one-fourth of the US ride-hailing market, suggesting that requiring TNCs to collect and remit sales taxes on their rides could generate over $300 million in state and local sales tax revenue nationwide. 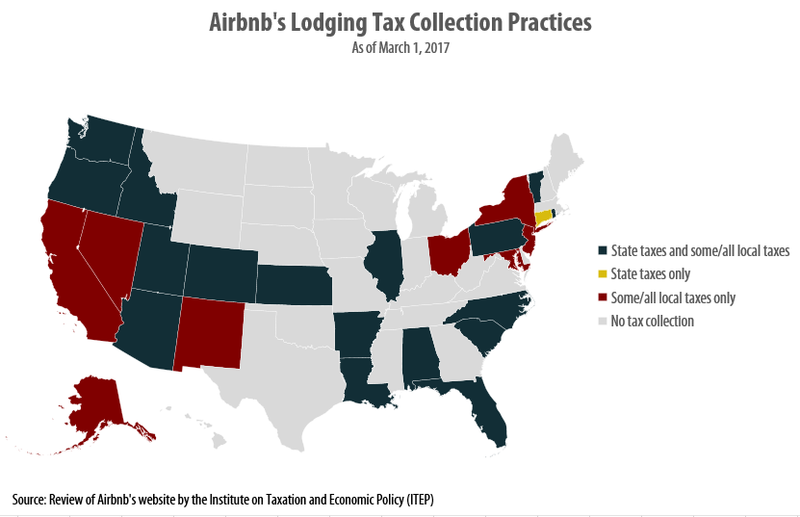 A recent study by AlltheRooms.com estimated that states would have collected a total of $440 million in 2016 in state-level lodging taxes based on Airbnb’s bookings if they were taxed at standard hotel rates in each municipality. Of that amount, more than $260 million (or 59 percent) went uncollected. The revenue loss is highly concentrated in large cities and major tourist destinations. New York City alone is estimated to have foregone $110 million in revenue, while Hawaii did not collect $51 million. In at least one city, tax revenue collections associated with Airbnb have significantly exceeded expectations. In the first five months after Airbnb began collecting a 14 percent occupancy tax in Los Angeles, it remitted a total of $13 million—far more than the $5.8 million figure city officials had expected the company would have remitted over the course of a full year. The revenues generated by taxes on Airbnb rentals should generally not be regarded as a windfall for states and localities, however. While the availability of Airbnb rentals may encourage some people to travel who would have otherwise stayed home, most travelers would have booked rooms at traditional hotels in Airbnb’s absence. According to the company, 63 percent of its Los Angeles customers and 70 percent of its Boston customers would have visited those cities even if Airbnb accommodations were not available. In this light, most of the taxes remitted by Airbnb are no more than an offset for the lodging tax revenue losses associated with reduced bookings at ordinary hotels. Determining the appropriate regulatory framework for on-demand businesses is at least as important as crafting reasonable tax policies for this industry. Since regulatory and tax policy issues often overlap in this context, the following discussion explores some of the regulatory issues involved. Most states have approved laws that include insurance requirements for TNC drivers and some states require background checks or vehicle inspections as well. In some instances, state-level regulations have been issued partly to preempt more stringent local regulations. Austin, Texas, for instance, has created a regulatory system that includes requiring ride-hailing companies to fingerprint their drivers. Uber and Lyft shut down their operations in Austin and unsuccessfully tried to convince voters to overturn the law via a referendum. Since the departure of Uber and Lyft, several smaller TNCs began serving the Austin market and Mayor Steve Adler reports that “I don’t think city is missing the services” of Uber and Lyft. Nonetheless, in what would be a blow to local control, Texas’s state-level lawmakers are considering prohibiting the types of regulations enacted by Austin. Uber and other TNCs are often exempt from hefty fees paid by the taxi industry. In New York City and Philadelphia, for instance, taxi drivers are required to possess a “medallion” to operate legally. As recently as 2014, these medallions were valued at over $1 million in New York City and over $500,000 in Philadelphia. The rise of TNCs has caused the value of these medallions to fall by half, or more, as the taxi industry has become less profitable. But the cost of these medallions remains a major expense faced by taxi drivers but not their TNC competitors. Philadelphia tax drivers also complain that TNCs are not subject to the same annual assessment fees ($1,819), biannual inspections ($75 each), and annual driver’s certificate fees ($125) that they must pay. Affordable housing advocates are concerned that short-term rentals such as Airbnb take units off the market for full-time residents. Several studies have found that a significant share of Airbnb’s business comes from full-time operators and multi-unit hosts. The company has also sparked opposition in cities for altering the character of neighborhoods and by facilitating the creation of what residents have called “neighborhood hotels” or “party houses.” Three U.S. senators wrote to the head of the Federal Trade Commission in July 2016 asking that it study the commercial use of online rental platforms. Airbnb has faced controversy in San Francisco and New York State over attempts to regulate the company. In San Francisco, Airbnb unsuccessfully challenged an ordinance that holds it responsible for rental listings that aren’t registered with the city and is now working with city officials to put a stop to illegal rentals. In New York, the company recently dropped a lawsuit after officials clarified that the fines associated with a state law prohibiting most short-term rentals under 30 days in New York City would be assessed against individual violators rather than the company itself. Secrecy is most valuable for the commercial-style lodging facilities that now fuel Airbnb’s growth, but that are also most likely to violate zoning and housing laws. Thus, the agreements facilitate unimpeded and often illegal conversions of residential property into commercial-style lodging facilities. Tax agencies signing these agreements enable this process. In other cases, state lawmakers have not been so receptive to local control and have taken steps to prevent localities from deciding whether to embrace platforms such as Airbnb. An Arizona law, for instance, has become a model for this type of preemption. New technology is driving economic change at a pace that state and local lawmakers and tax administrators have not always been able to match. The following list of recommendations is geared toward ensuring that tax systems are reflective of today’s economy and fair in their treatment of new types of businesses and the more familiar companies against which those businesses often compete. State and local sales and gross receipts taxes should be broadly applied to most of the purchases consumers make, rather than being riddled with exemptions and carveouts. In the context of the ride-hailing industry, this means that these taxes should be expanded to include not only traditional taxi and limousine services, but also services offered by TNCs such as Uber and Lyft. For online rental platforms such as Airbnb, this means that sales taxes and lodging taxes should be applied in the same manner that they are applied at traditional hotels. To ease taxpayer compliance, online intermediaries, and not the individual drivers or hosts, should be responsible for calculating and remitting the taxes due. Hosts should be individually responsible only if they do not use an online platform. Sales taxes and other taxes applied to services furnished by the on-demand industry should be based on the full price of the service paid by the consumer, including the portion of the ride or room cost that goes to the online intermediary. Hosts who rent properties they do not occupy as their primary residence should not be eligible for property tax breaks geared for owner-occupants. States and localities can improve their enforcement in this area by scrutinizing homeowners reporting significant rental income and requiring that Airbnb and similar platforms provide information on properties that have been rented via their websites. States should authorize local governments to apply local taxes to on-demand businesses. States and localities should not sign voluntary agreements under which an online rental platform collects taxes when they are unable to adequately regulate its operations. A clear regulatory and tax framework should be codified in law. Where appropriate, governments should seek back taxes when they should have been paid. Officials should monitor the rapid pace of change in these new and diversifying industries, and ensure that on-demand companies continue to pay appropriate taxes as their business models evolve. Most states and localities have not updated their tax systems to adequately apply to on-demand companies. As these companies continue to grow and expand, sometimes at the expense of more traditional businesses, tax systems are running the risk of falling even further behind and revenue collections are likely to suffer as a result. For reasons of both fairness and revenue adequacy, it is imperative that states and localities update their tax codes to account for these new business models, and that they remain prepared to implement additional updates as those business models continue to evolve. Uber claims that it enjoys between 84 and 87 percent of the U.S. ride-hailing market. Newcomer, Eric, “Uber Loses at Least $1.2 Billion in First Half of 2016,” Bloomberg Technology, Aug. 25, 2016, at https://www.bloomberg.com/news/articles/2016-08-25/uber-loses-at-least-1-2-billion-in-first-half-of-2016. Taylor, Harriet, “Pipsqueak Lyft could reach profitability before giant rival Uber,” CNBC, Jan. 12, 2017, at http://www.cnbc.com/2017/01/12/pipsqueak-lyft-could-reach-profitability-before-giant-rival-uber.html. Katz, Lawrence F. and Alan B. Krueger, “The Rise and Nature of Alternative Work Arrangements in the United States, 1995-2015,” National Bureau of Economic Research Working Paper No. 22667, Issued Sep. 2016, http://www.nber.org/papers/w22667. Institute on Taxation and Economic Policy, “Why Sales Taxes Should Apply to Services,” July 27, 2016, at https://itep.org/itep_reports/2016/07/why-sales-taxes-should-apply-to-services.php. ITEP analysis of data from the Federation of Tax Administrators and various state sources, including information received from state revenue departments. 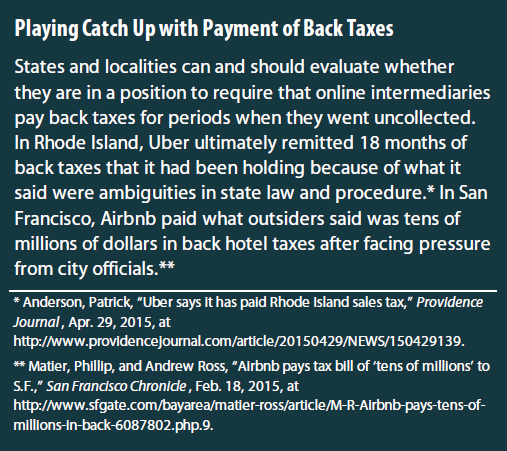 Anderson, Patrick, “Uber says it has paid Rhode Island sales tax,” Providence Journal, Apr. 29, 2015, at http://www.providencejournal.com/article/20150429/NEWS/150429139. Rhode Island House Bill 8044 of the 2016 Regular Session. Available at https://legiscan.com/RI/text/H8044/2016. Finding by Zach Schiller (Ohio), a co-author of this report, in reference to four January 2017 rides with Uber, and email correspondence with Wesley Tharpe (Georgia) in reference to rides with Uber in December 2016 and with Lyft in April 2016. Bluestein, Greg, “Georgia lawmakers weigh whether to levy tax on Uber, Lyft rides,” Atlanta Journal Constitution, Mar. 6, 2017, at http://politics.blog.ajc.com/2017/03/02/georgia-lawmakers-weigh-whether-to-levy-tax-on-uber-lyft-rides/. Couloumbis, Angela, “Wolf signs bill making Uber, Lyft legal in Philly,” The Philadelphia Inquirer, Nov. 4, 2016, at http://www.philly.com/philly/news/politics/20161105_Wolf_signs_bill_making_Uber__Lyft_legal_in_Philly.html. As of 2016, combined state-level sales and lodging tax rates ranged up to 15 percent in Connecticut. National Conference of State Legislatures, “State Lodging Taxes,” Sep. 15, 2016, at http://www.ncsl.org/research/fiscal-policy/state-lodging-taxes.aspx. Spielman, Fran, “Emanuel meets with Airbnb, with new idea in the works,” Chicago Sun-Times, Feb. 6, 2017, at http://chicago.suntimes.com/news/emanuel-meets-with-uber-with-new-idea-in-the-works/. Airbnb, Airbnb Policy Tool Chest, at https://www.airbnbcitizen.com/wp-content/uploads/2016/12/National_PublicPolicyTool-ChestReport-v3.pdf. Data accessed March 1, 2017 at https://www.airbnb.com/help/article/653/in-what-areas-is-occupancy-tax-collection-and-remittance-by-airbnb-available. Pinho, Rute, “Sales and Hotel Tax Rates in the Northeast,” Connecticut Office of Legislative Research, Nov. 28, 2011, at https://www.cga.ct.gov/2011/rpt/2011-R-0416.htm. Fishell, Darren, “Airbnb agrees to collect taxes in Maine,” Bangor Daily News, Feb. 28, 2017, at https://bangordailynews.com/2017/02/28/business/airbnb-agrees-to-collect-taxes-in-maine/. Zervas, Georgios, Davide Proserpio and John W. Byers, “The Rise of the Sharing Economy: Estimating the Impact of Airbnb on the Hotel Industry,” Boston University School of Management Research Paper, Last revised Nov. 18, 2016, http://cs-people.bu.edu/dproserp/papers/airbnb.pdf. 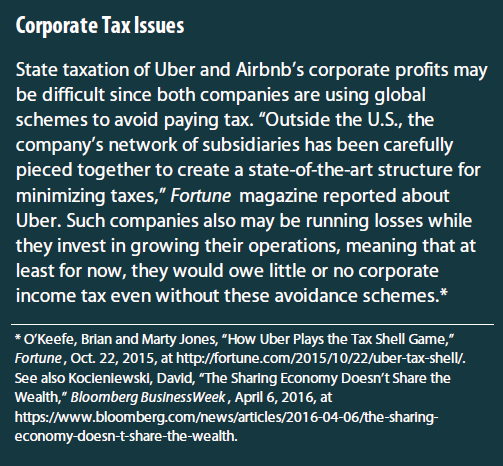 Slack, Mike, “Uber Driver Taxes: Listen Up!,” H&R Block, Feb. 14, 2015, at http://blogs.hrblock.com/2015/02/14/moonlighting-as-an-on-demand-driver-can-be-unexpectedly-taxing/. Drenkard, Scott, “Kansas’ Pass-through Carve-out: A National Perspective,” Tax Foundation testimony before the Kansas House Committee on Taxation, Mar. 15, 2016, at https://taxfoundation.org/kansas-pass-through-carve-out-national-perspective/. Saunders, Laura, “Airbnb Income May Be Tax-Free—But There’s a Catch,” The Wall Street Journal, Apr. 2, 2015, at https://www.wsj.com/articles/popular-tax-break-can-lead-to-filing-hassles-1427982638. ITEP resources related to the property tax are available at: https://itep.org/category/property-taxes/. Carter-Conneen, Mike, “D.C. Council member targets ‘illegal hotel,’ plans new Airbnb regs,” WJLA ABC7, Dec. 15, 2016, at http://wjla.com/news/local/dc-council-member-targets-illegal-hotel-plans-new-airbnb-regs. Benner, Katie, “New Orleans Becomes New Model for Airbnb to Work With Cities,” The New York Times, Dec. 7, 2016, at https://www.nytimes.com/2016/12/07/technology/new-orleans-airbnb-model.html. Airbnb, “Chicago Home Sharing Registration: Frequently Asked Questions,” at https://www.airbnb.com/help/article/1495/chicago-home-sharing-registration–frequently-asked-questions. Schaller, Bruce, “Unfinished Business: A Blueprint for Uber, Lyft and Taxi Regulation,” Schaller Consulting, Sep. 20, 2016, http://www.schallerconsult.com/rideservices/blueprint.pdf. The math underlying this calculation is based on reports that Lyft’s US sales amounted to $700 million in 2016, and Uber’s claim that it enjoys a US market share roughly six times the size of Lyft’s. Together, these figures suggest that TNCs made sales in excess of $4.8 billion in the US in 2016. Applying the median sales tax rate of 6.9 percent to this amount suggests over $330 million in potential tax revenue. Newcomer, Eric, “Lyft Loses $600 Million in 2016 as Revenue Surges,” Bloomberg Technology, Jan. 12, 2017, at https://www.bloomberg.com/news/articles/2017-01-12/lyft-loses-600-million-in-2016-as-revenue-surges. Newcomer, Eric, “Uber Loses at Least $1.2 Billion in First Half of 2016,” Bloomberg Technology, Aug. 25, 2016, at http://www.geekwire.com/2016/report-uber-claims-87-u-s-market-share-losses-mount-1-27b/. AllTheRooms, “Vacation Rental Market Analysis: 440 Million Reasons to Tax Airbnb Vacation Rentals,” Oct. 24, 2016, at http://src.bna.com/jC2. Bergman, Ben, “In just 5 months, LA collected $13 million in Airbnb taxes,” KPCC, Jan. 20, 2017, at http://www.scpr.org/news/2017/01/20/68312/in-just-5-months-la-collected-13-million-in-airbnb/. Airbnb, “New Study: Airbnb Community Generates $312 Million in Economic Impact in LA,” Dec. 4, 2014, at https://www.airbnb.com/press/news/new-study-airbnb-community-generates-312-million-in-economic-impact-in-la. Airbnb, “New Study: Airbnb Community Generates $51 Million in Economic Impact in Boston,” Dec. 19, 2014 at: https://www.airbnb.com/press/news/new-study-airbnb-community-generates-51-million-in-economic-impact-in-boston. Velasquez, JJ, “State ride-hailing legislation could drive Uber, Lyft back to Austin,” Community Impact Newspaper, Jan 25. 2017, at https://communityimpact.com/austin/news/2017/01/25/state-ride-hailing-legislation-drive-uber-lyft-back-austin/. Mosendz, Polly and Shahien Nasiripour, “Taxi Medallion Prices Are Plummeting, Endangering Loans,” Bloomberg, Jan. 30, 2017, at https://www.bloomberg.com/news/articles/2017-01-30/taxi-medallion-prices-are-plummeting-endangering-loans. Feiner, Lauren, “Taxi owners hang on to once-coveted medallions, hoping for a rebound,” The Philadelphia Inquirer, Aug. 20, 2016, at http://www.philly.com/philly/columnists/jason_laughlin/20160821_Taxi_owners_hang_on_to_once-coveted_medallions__hoping_for_a_rebound.html. Samaan, Roy, “Airbnb, Rising Rent, and the Housing Crisis in Los Angeles,” March 2015, at http://www.laane.org/wp-content/uploads/2015/03/AirBnB-Final.pdf. New York State Attorney General Eric T. Schneiderman, “Airbnb in the City,” Oct. 2014, at https://ag.ny.gov/pdfs/AIRBNB%20REPORT.pdf. O’Neill, John W. and Yuxia Ouyang, “From Air Mattresses to Unregulated Business: An Analysis of the Other Side of Airbnb,” Study funded by the American Hotel & Lodging Educational Foundation, May 2016, at http://hhd.psu.edu/media/shm/Center-for-Hospitality-Real-Estate-Strategy/files/AHLA_Airbnb_Summary_2016_May_National.pdf. Grover, Joel, Matthew Glasser, and Cole Sullivan, “Short-Term Rentals Turn Into Nightmares Next Door,” NBC4 Los Angeles, Mar. 2, 2017, at http://www.nbclosangeles.com/investigations/I-Team-Investigation-Short-Term-Rentals-Property-Airbnb-415128373.html. Kendall, Marisa, “Oakland residents to weigh in as city plans new Airbnb rules,” The Mercury News, Jan. 11, 2017, at http://www.mercurynews.com/2017/01/11/oakland-residents-to-weigh-in-as-city-plans-new-airbnb-rules/. Raymond, Nate, “Airbnb, New York City settle rental law lawsuit,” Reuters, Dec. 2, 2016, at http://www.reuters.com/article/us-airbnb-new-york-idUSKBN13S03U. Bucks, Dan R., “Airbnb Agreements with State and Local Tax Agencies,” Report funded by the American Hotel and Lodging Association, March 2016, at https://www.ahla.com/sites/default/files/Airbnb_Tax_Agreement_Report_0.pdf. Gallagher, Kathleen, “Ige vetoes Hawaii’s Airbnb tax broker measure but likes ‘intent of bill’,” Pacific Business News, Jul. 20, 2016, at http://www.bizjournals.com/pacific/news/2016/07/12/ige-vetos-hawaiis-airbnb-tax-broker-measure-but.html. Governor David Y. Ige, Statement of Objections to House Bill No. 1850, July 11, 2016. American Legislative Exchange Council, “An Act Relating to Online Marketplaces — Establishing Statewide Standards, Protecting Privacy, and Enabling Efficient Tax Remittance,” Sept. 12, 2016, at https://www.alec.org/model-policy/an-act-relating-to-online-lodging-marketplaces-establishing-statewide-standards-protecting-privacy-and-enabling-efficient-tax-remittance/.